Software defect (also known as bugs, incident, fault) is a variation in the expected and actual behavior of test results during test case execution. Different companies/ organization use different naming conventions to describe these variations like bug, defect, problem, issues, incidents and faults etc. Well, every incident reported by testing team may not be a defect or bug. Some incidents may be a cause of lack of tester’s understanding of the expected or actual behaviors of the application or requirements. Easy reporting of all software/ application defects in the database. Prioritizing the defects as per their importance and impact on the client’s business. Updating the defects status time to time. Searching or filtering any defects in the database. Generating defect reports which can help project stakeholders in decision making. Mantis is an open source web application. It can be hosted internally within the organization. It supports many platforms like Windows, Mac, Solaries, Linux. Mantis is available in 68 different localized languages. It support multiple project handling on a single installation. Each project has its own database for defects. It also supports projects, sub-projects and categories. There is no limit on number of projects, users and defects. It support role based security. New users can be easily created and assigned with different access rights. Access rights can be assigned project specific as well. Mantis support change logs. It means that users can see a history of all changes made to the defects. It support full text search, simple and advanced filter options, and shared filters across projects. 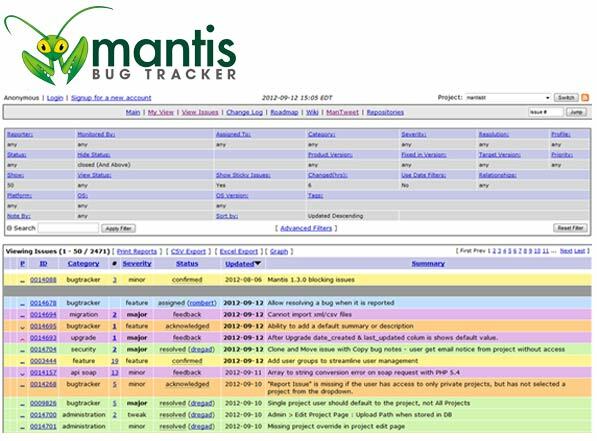 Mantis provides many defect reports and graphs to represent the project defect status. Admin or any authorized user can add/delete customized fields in defect reporting form. It support email notification configurations. You can configure email notifications for each defect update, status change, defect comments etc.. It support defect export to csv, excel and ms-word files. It support Public/ Private Projects and Issues. Public project accessible to all users, private are only accessible to those explicitly added. Private issues are accessible to users with a specific access level to the relevant project. It support time tracking for each defect. The developer / tester can track time spent in testing or fixing any specific defect. It support attachments for each defect. You can attach screen shot, videos and log files to any defect. It allows user to update the status of multiple defects on single click. The user just needs to select the multiple defects to update their status. User can assign multiple defects to a technician/ developer on single click. Mantis provides simple and advanced defect views. Two defects can be interrelated with each other by just creating a simple relation between 2 defects. Defects from one project can be moved easily to another project. User can create a copy of the defect. This presents the user with a new issue reporting form with all of the information in the current issue filled in. It is a unique identification number assigned to each defect. Mantis assigns a unique number to each defect automatically. Severity describes the impact of the defect in the application. The defect severity could be tweak, minor, major, critical, crash and show stopper. Priority describes the importance of the defect to fix. Defect priority could be low, medium, high, top etc. Application build version in which specific defect was found. A list of users who is going to fix the specific defect. Importance of defect from client’s business point of view. Impact of defect on application. For example if there is just a spelling mistake on page then its severity is “Minor”. But if page is breaking on a click then it has “Major” severity. High level details of problem in 15-20 words. A description should have full defect details like, steps to reproduce, environment details (like browser, operating system details), actual defect and expected behavior. Tester should attach log files, screenshot, video and any other supporting files which can help the development team while fixing the defect. These additional documents also help testers during fix verifications. Mantis automatically captures the current date as date reported. Whenever there is a change in defect, mantis automatically set date updated. At Training-Specialists we are teaching Mantis Bug Tracker under QA Training.